Just beneath the surface of the ocean floats a tiny egg. 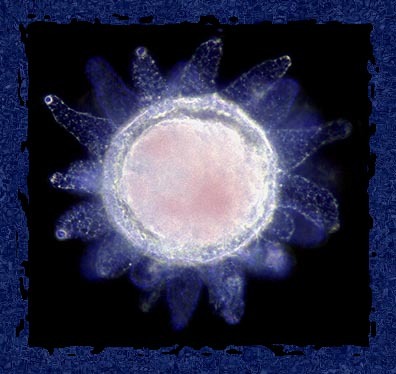 Within its hull of follicle cells the embryo of Ciona, a sea squirt or Ascidian, is beginning to develop. The shape of the egg does not give any clue of the creature that it is going to be. Now about a third of a millimeter it is waiting to become a larva, and this larva is a rather surprising creature. The larva is developing within a few weeks. A head and a tail are evolving. When you look carefully you can see a rod that stiffens the tail. We know such a device as a notochord, A trained zoologist would identify the animal as belonging to the Phylum Chordata, and that is the same group we humans belong to. (See footnote). So there is something suspicious about these so-called sea squirts. Freed from its shell a familiar form has appeared. 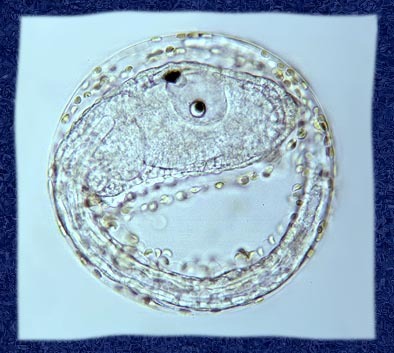 Clearly the resemblance with a tadpole larva is seen. The little creature swims for a few hours to find a good spot somewhere on a solid surface. Then a surprising thing happens. This larva is not going to evolve into a fish, amphibian or anything like that. With the front of its head it attaches itself to a surface. Within minutes resorption of the larva tail commences and the sea squirt will stay on that same spot for all its life. The photographs on this page were made by Wim van Egmond. Footnote: Some authorities (e.g. Margulis and Schwartz) now split the chordates over three phyla i.e. the Craniata, Cephalochordata and Urochordata, the latter phylum includes the sea squirts. Return to article. Published in August 1998 Micscape Magazine.